With this opening paragraph, legendary investor and entrepreneur Peter Thiel immediately launches into the central lesson of his new book Zero to One. Creating new things in the form of truly “fresh and strange” technology is what will propel the economies of the future, not minute tinkering or copying of existing practices. This is what he describes as going from 0 to 1. To get to the future, startups are the key. Having launched or played critical roles in supporting multiple successful companies including PayPal, Facebook, Palantir, SpaceX, and LinkedIn, Mr. Thiel’s views on technology, innovation and entrepreneurship were of particular interest to me. Zero to One has proven to be a delightful read full of insights for students, young professionals, and seasoned industry insiders. Each chapter contains ideas that are provocative and original. New technology matters more than globalization. In Thiel’s terms, globalization means “taking things that work somewhere and making them work everywhere” (going from 1 to n). Without creating new ways of harnessing scarce resources, unsustainability and environmental devastation are inevitable, especially as countries such as China seek to model current U.S. living standards for their immense populations. New technology is what enables people to do more with less. Acts of singular creation often result in monopolies, and monopolies should be actively sought and embraced by entrepreneurs. Thiel, however, is careful to distinguish what he means by his controversial assertion, “Monopoly is the condition of every successful business.” Thiel has no love for monopolies propped up and enforced through government (e.g., the U.S. Postal Service), but favors “the kind of monopoly that’s so good at what it does that no other firm can offer a close substitute.” Google, for instance, dominates online searches because it is simply better than the alternatives. The same goes for Facebook in social networking. On the opposite end, Thiel denounces competition as “an ideology... that pervades our society and distorts our thinking.” He explains that under the state of “perfect competition” idealized by neoclassical Economics 101, no company in the long run can make any profit. Thiel highlights the lesson for entrepreneurs: “if you want to create and capture lasting value, don’t build an undifferentiated commodity business.” Under “perfect competition,” businesses become so absorbed in focusing on today’s margins that they won’t be able to plan for a long-term future. Monopolies are the drivers of innovation and progress because a lock on years or decades of profits “provides a powerful incentive to innovate.” Monopoly profits allow for companies to “make long-term plans and to finance ambitious research projects that firms locked in competition can’t dream of.” For instance, Google had the time and resources to research and develop self-driving cars, Android smartphones, and wearable computers thanks to its dominance in online searches. 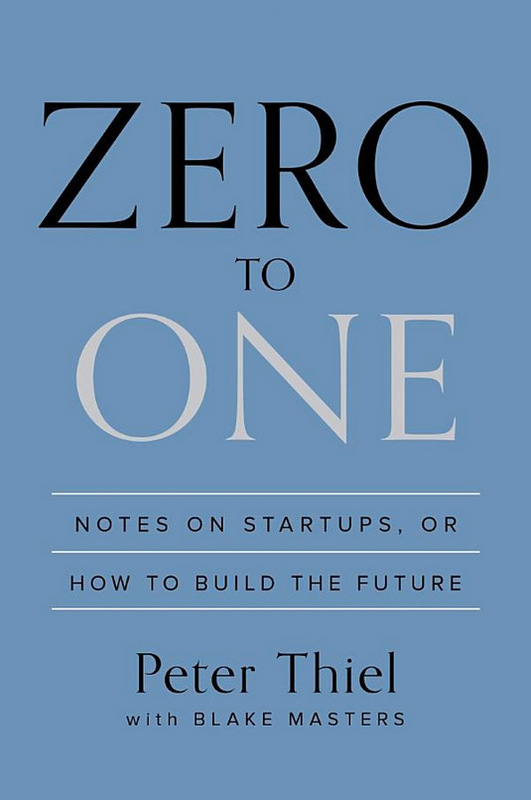 The rest of Zero to One builds upon these fundamental ideas and brings in other parts of Thiel’s contrarian thinking that seems to have brought him much success. In one chapter explaining why it’s better to be the last mover in a market, Thiel offers a list of characteristics for building any company into a monopoly. I felt this outline was particularly useful and can be applied to any organization that wants to endure. Develop proprietary technology that is at least 10x better than its closet substitute; e.g., Amazon offers a massive book inventory that is beyond that of any brick-and-mortar bookstore. Take advantage of network effects, but the product must offer value to its first users when the network is small; e.g., Facebook was initially limited to Harvard students, followed by the rest of the Ivy League, then all U.S. college students, and finally everyone else on the planet. Create economies of scale; e.g., Twitter can continually add new users without spending too much time creating more custom features. Build a strong brand; e.g., Apple is distinguished for its sleek, minimalist designs, positioning as a maker of premium products, omnipresent advertising campaigns, control of the customer experience, and lingering influence of Steve Jobs. If we already understand as much of the natural world as we ever will—if all of today’s conventional ideas are already enlightened, and if everything has already been done—then there are no good answers. Contrarian thinking doesn’t make any sense unless the world still has secrets left to give up. Unfortunately, conventional schooling aims to impart (if not flat-out indoctrinate) established views and political correctness, kills creativity, and directly promotes submission to authority. Thiel blames our educational system as well as other social trends that encourage risk aversion and complacency. Explorers who “take the hidden paths” and defy orthodoxy are the least likely to emerge from this kind of environment. However, these are the types of people who are best suited to become budding entrepreneurs who build innovative companies that drive progress. In order to build a successful company that creates value, one must do something that no one has done before. For that to happen, the seeker must tap into secrets that aren’t already universally understood and look where no one else is looking. Thiel also devotes a substantial number of pages on the art of hiring and bringing together the “right team,” especially when it comes to the foundations of a company. It is crucial to get the beginning right because “a startup messed up at its foundation cannot be fixed.” Not only do founders need to be able to work harmoniously together, everyone else in the company needs to be composed of like-minded individuals with diverse talents and be “bound together by a sense of mission.” Small groups fulfilling this description, whether it be the Founding Fathers of America or Fairchild Semiconductors’ “traitorous eight,” ended up “chang[ing] the world for the better.” Thiel reiterates that “only at the start do you have the opportunity to set the rules that will align people toward the creation of value in the future.” It is even possible to extend the founding indefinitely provided that the organization maintains an “openness to invention” and keeps creating new things. Thiel recognizes that “nothing short of a cultural revolution” is needed to overthrow entrenched views and practices. If people wish to live in a new epoch filled with flying cars and moon colonies, they must “find singular ways to create the new things that will make the future not just different, but better—to go from 0 to 1.” Ultimately, technological progress will have to be guided by a philosophy of definite optimism. These lessons on how to think, not just what to think, and how to actively make use of talent are what have made Zero to One so enjoyable for me to read. All in all, I wholeheartedly recommend this book to any aspiring entrepreneur. As we go further into the twenty-first century and confront new challenges, we will need many more original thinkers and even more people who will put their ideas into practice. Thiel’s book provides a blueprint. The explorers now need to step forward and blaze new paths.